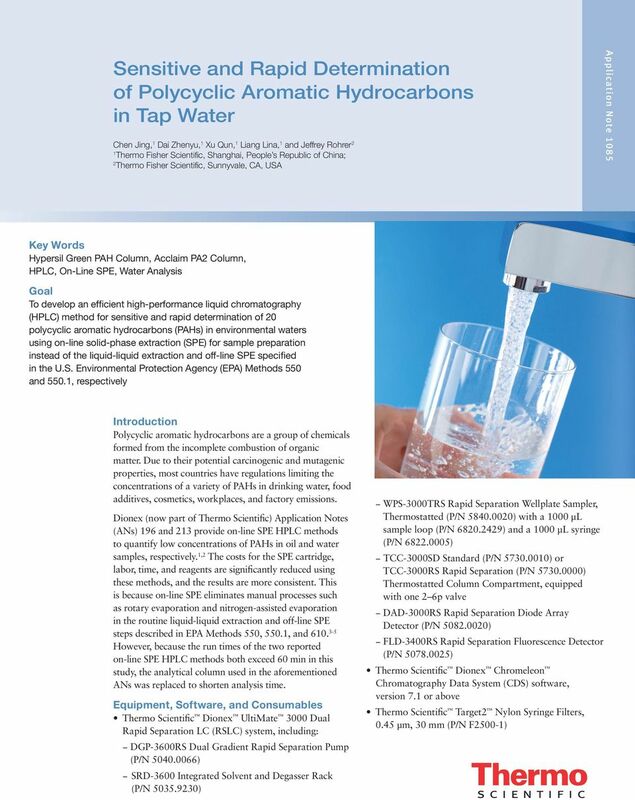 Download "Sensitive and Rapid Determination of Polycyclic Aromatic Hydrocarbons in Tap Water"
5 Preparation of Water Samples Tap water samples were collected at the Thermo Scientific Shanghai HPLC Applications Laboratory located in the Pudong District, Shanghai, People s Republic of China. Filter water samples using nylon syringe filters prior to injection. Add 200 μl of Stock Standard Mix 2 (1.0 mg/l of each PAH) and 39.8 ml of each filtered water sample to a conical flask with plug. The concentration of each PAH in the spiked water sample will be 5 μg/l. Add 200 μl of the calibration standard with a concentration of 10 µg/l of each PAH and 39.8 ml of each filtered water sample to a conical flask with plug. 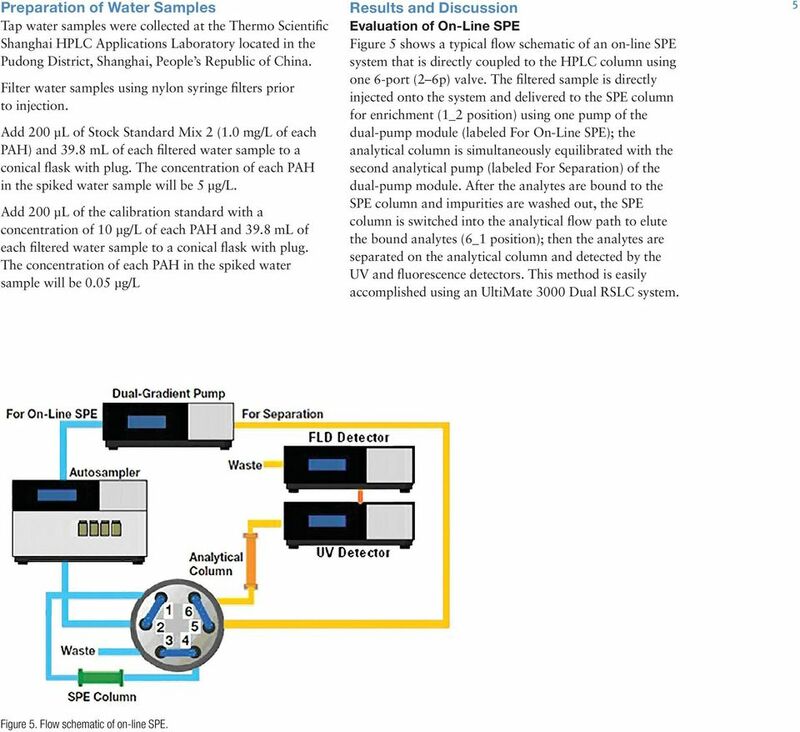 The concentration of each PAH in the spiked water sample will be 0.05 μg/l Results and Discussion Evaluation of On-Line SPE Figure 5 shows a typical flow schematic of an on-line SPE system that is directly coupled to the HPLC column using one 6-port (2 6p) valve. The filtered sample is directly injected onto the system and delivered to the SPE column for enrichment (1_2 position) using one pump of the dual-pump module (labeled For On-Line SPE); the analytical column is simultaneously equilibrated with the second analytical pump (labeled For Separation) of the dual-pump module. After the analytes are bound to the SPE column and impurities are washed out, the SPE column is switched into the analytical flow path to elute the bound analytes (6_1 position); then the analytes are separated on the analytical column and detected by the UV and fluorescence detectors. This method is easily accomplished using an UltiMate 3000 Dual RSLC system. 5 Figure 5. Flow schematic of on-line SPE. 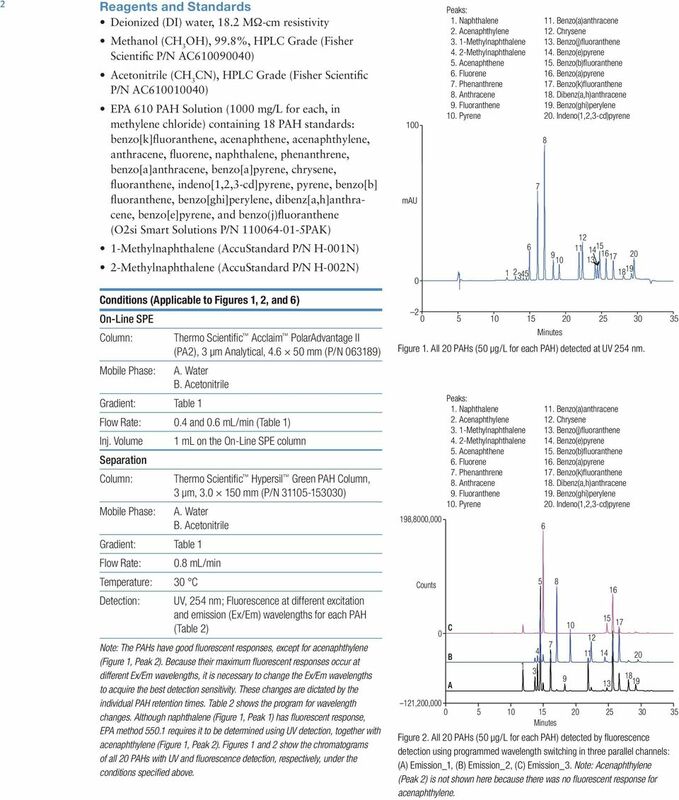 6 6 Selection of On-Line SPE and Analytical Columns As discussed in the previous work (AN 213), 2 the Acclaim PA2 column is a good choice as a SPE column for on-line SPE preconcentration of a large volume of 100% aqueous sample, which is why it was chosen for this work. The Hypersil Green PAH column that features specially tailored alkyl-bonded silica with high carbon loading was chosen as the analytical column. 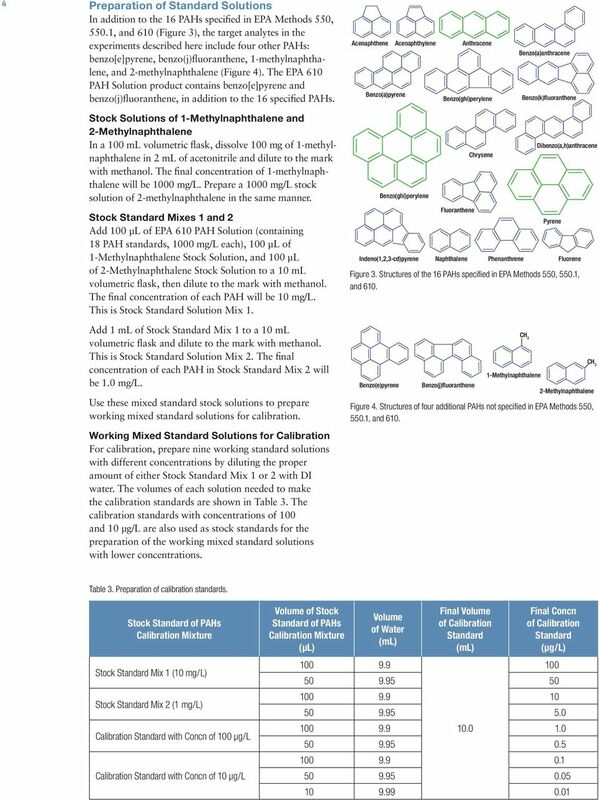 This column was designed specifically for the separation of PAHs and optimized for the published EPA methods. 3 5 The column resolves benzo[e]pyrene, benzo[j]fluoranthene, and benzo[b]fluoranthene, which have similar structures (Figure 1). As shown in Figures 1 and 2, using the combination of Acclaim PA2 and Hypersil Green PAH columns under the specified conditions, on-line SPE followed by HPLC can be accomplished in 35 min with baseline separation of 20 PAHs. Determination of Ex/Em Maximums for PAHs All 20 PAHs except acenaphthylene can be detected using a fluorescence detector, which usually offers much higher sensitivity than UV detection. As previously discussed, each PAH has its own Ex/Em maximum, and thus programmed fluorescence wavelength switching (switching to the Ex/Em maximum wavelength of each individual PAH when the PAH peak passes through the fluorescence detector) is necessary to obtain the best sensitivity for each PAH. To determine the appropriate fluorescence Ex/Em wavelength for each PAH, a PAH standard mixture was injected and the diode array detector used to obtain the maximum of UV absorption (UVmax) of each PAH. This experiment showed that all UVmax of PAHs were close to 220, 240, or 280 nm. So, initially 220, 240, and 280 nm were used as the excitation wavelengths to perform emission scans for each PAH in order to determine its emission maximum. Excitation scans were performed using resultant emission maximums for all PAHs. 6 The determined Ex/Em maximums for each PAH are shown in Table 2. Optimization of Detection Parameters Unfortunately, practical problems as when two peaks elute close to one another sometimes prevent switching to the appropriate Ex/Em wavelength for each PAH peak. When wavelength switching is programmed during the elution of a peak or even at the shoulder of a peak, the detector can be saturated and the analysis that follows can be disrupted. To resolve this problem, when two nearby peaks need to use different wavelengths, three parallel fluorescence monitoring channels are used to perform the analysis (one channel for each of the nearby peaks). For example, as shown in Figure 2, benzo(j)fluoranthene (Peak 13), benzo(e)pyrene (Peak 14), and benzo(b) fluoranthene (Peak 15) elute in a small retention time window; therefore, three parallel fluorescence monitoring channels (Emmisions_1, _2, and _3) are used for their determination. For the same reason, 1-methylnaphthalene (Peak 3), 2-methylnaphthalene (Peak 4), acenaphthene (Peak 5), and fluorene (Peak 6) are also monitored using three parallel fluorescence monitoring channels. 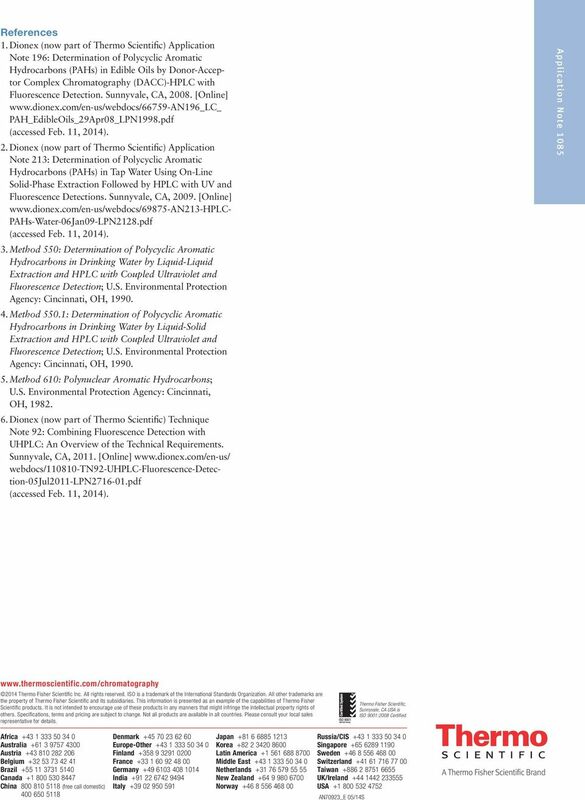 Table 2 lists the parallel fluorescence monitoring channels used for all 20 PAHs. 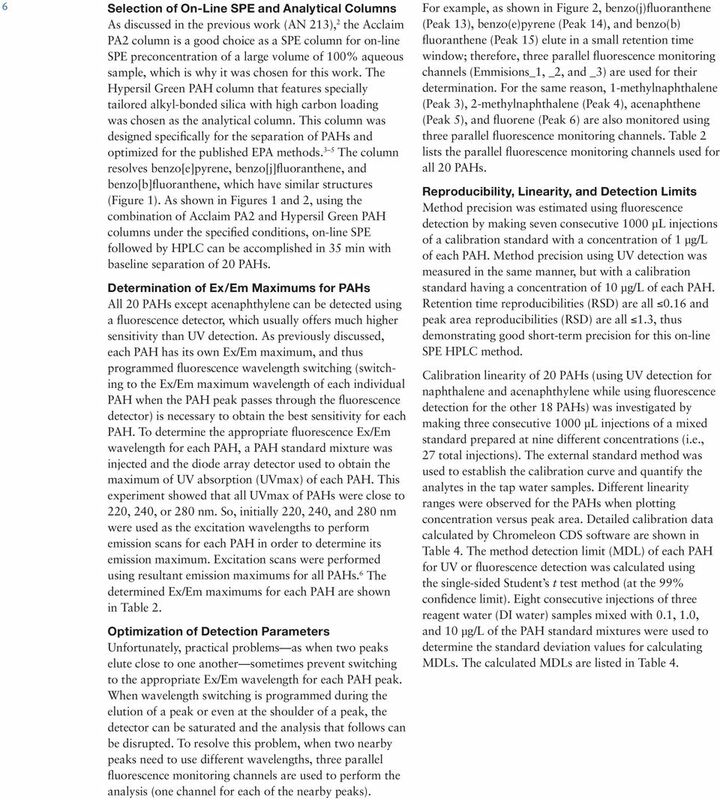 Reproducibility, Linearity, and Detection Limits Method precision was estimated using fluorescence detection by making seven consecutive 1000 μl injections of a calibration standard with a concentration of 1 μg/l of each PAH. Method precision using UV detection was measured in the same manner, but with a calibration standard having a concentration of 10 μg/l of each PAH. Retention time reproducibilities (RSD) are all 0.16 and peak area reproducibilities (RSD) are all 1.3, thus demonstrating good short-term precision for this on-line SPE HPLC method. Calibration linearity of 20 PAHs (using UV detection for naphthalene and acenaphthylene while using fluorescence detection for the other 18 PAHs) was investigated by making three consecutive 1000 µl injections of a mixed standard prepared at nine different concentrations (i.e., 27 total injections). 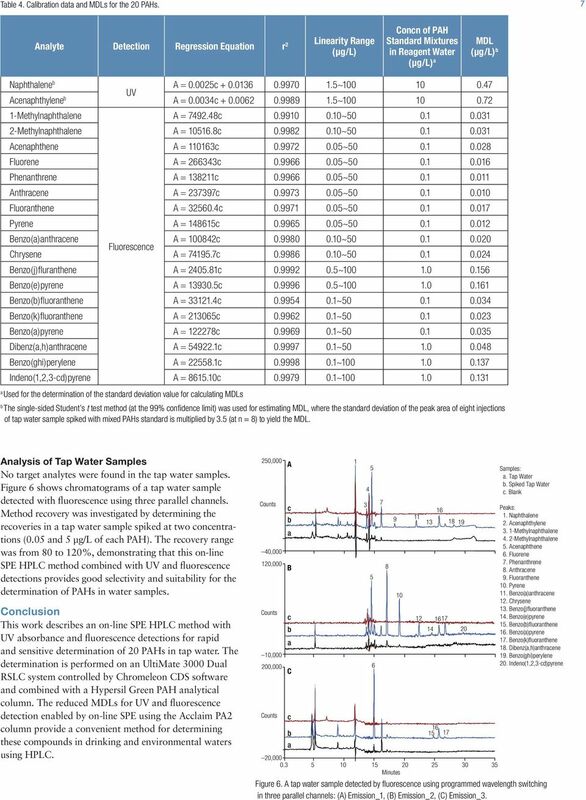 The external standard method was used to establish the calibration curve and quantify the analytes in the tap water samples. Different linearity ranges were observed for the PAHs when plotting concentration versus peak area. Detailed calibration data calculated by Chromeleon CDS software are shown in Table 4. The method detection limit (MDL) of each PAH for UV or fluorescence detection was calculated using the single-sided Student s t test method (at the 99% confidence limit). Eight consecutive injections of three reagent water (DI water) samples mixed with 0.1, 1.0, and 10 μg/l of the PAH standard mixtures were used to determine the standard deviation values for calculating MDLs. The calculated MDLs are listed in Table 4. 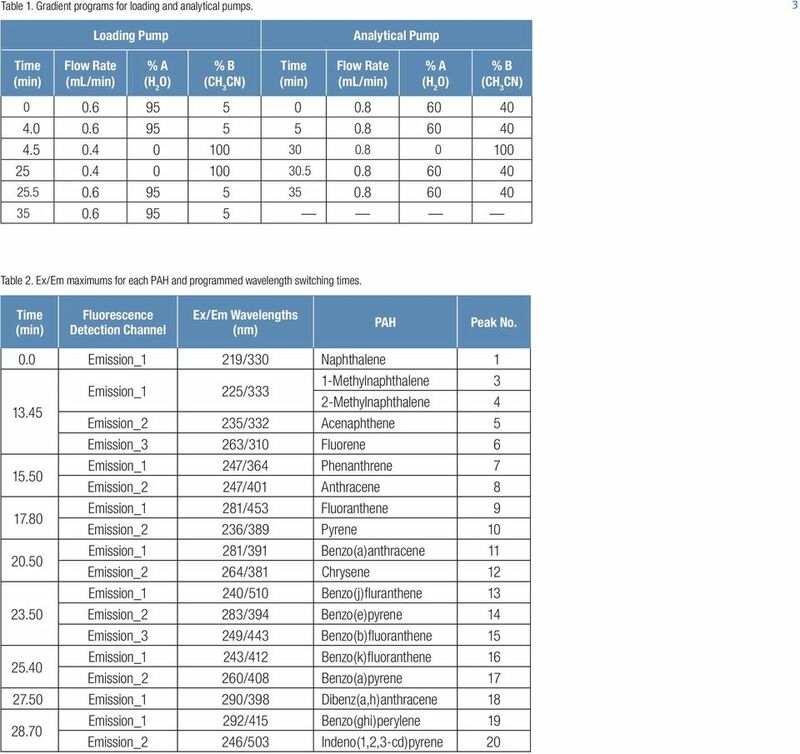 A Practical Approach to Validation of HPLC Methods Under Current Good Manufacturing Practices Introduction Analytical methods validation is an important regulatory requirement in pharmaceutical analysis. Integral Process Ana Optimize Your Process Operations by Improving Process Monitoring All industrial processes have a common need reliable, accurate, and timely methods for analyzing process chemistry.